I counted eight people all kneeling or standing, giving total attention towards the struggling mind and body of David Price. He was laying on his back, trying to sit up, clutching on to the arm of the referee and mouthing something I couldn’t hear. The doctors looked into his eyes. The camera tried its best to zoom right in through the bodies so we could do the same. The Principality Stadium leaned in on David and mocked him with polite applause and gasps. ‘Old glass-jaw has done it again,’ said my friend. Across the other side of the ring, dutifully pacing around in a neutral corner, lurked Alexander Povetkin. He was on his own. This September, as we all know, Povetkin is up for his first shot at a real world title since that evening in 2013 when he was hugged into submission by Wladimir Klitschko. He didn’t disgrace himself that night although the card told a grim tale. Still, boxing cards are like pictures of cakes – you get a look at the icing, but it could well be filled with dog food for all you know. Povetkin was held and leaned on by Klitschko, mugged like a toothless Russian bear tied to a pole and dancing to a man in fancy clothes playing a whistle. He deserved better refereeing. He had earned more respect. Anthony Joshua is not Klitschko, and he isn’t David Price. He is a less mobile and less savvy, yet more powerful version of a Klitschko’esq fighter. He’s a bit like Vitali, but not as angry, and without the war scars. And he retired Wladimir in a great fight where no-one left feeling like they’d had their pockets picked and then filled with cold gravy. He is the real thing: a champ who deserves to be holding belts above their head. So, what’s the point of the fight? 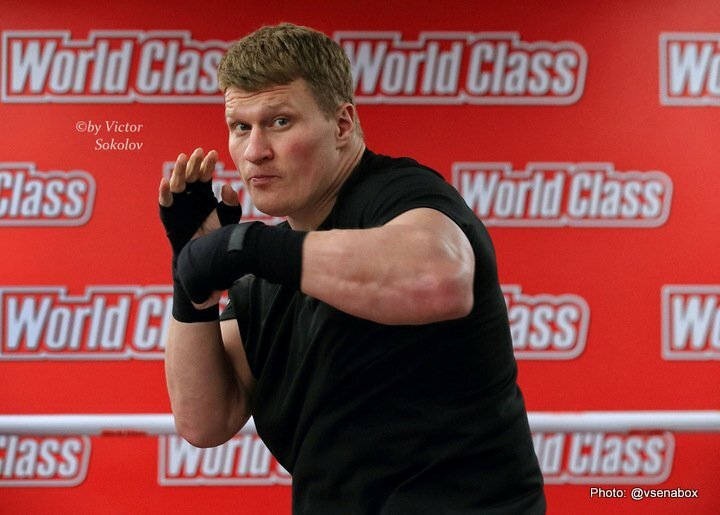 Is Povetkin the best the division has to offer? I’ve always rated Povetkin. He’s compact (6’2”), tucked in, aggressive, and he takes a punch well, but those positives are also negatives in a division where the norm is for a fighter to be at least 6’4” with freakishly long arms. Still, Povetkin is a master of crossing the distance, where he works under an opponent’s jab by heading straight to the body. His overhand right is still a beautiful thing to see. It’s more powerful, curved, and less telegraphed than Chisora’s, and it has hurt many men. He will present Joshua with the kinds of questions Dillian Whyte asked of him, but at almost forty years of age do those questions now have a ready answer from the champ? Has time and circumstance turned Povetkin into the most credible man to fill a gap in the queue until the real money can be thrashed out and the likes of Wilder, Fury, or a more dangerous looking Whyte come to knock on the Matchroom door with their begging bowls? Yes, and no. Povetkin knows the game. He’s waited and he’s fought who he’s been told to for years now patiently. He is a reliable challenger and he is a good and dangerous opponent (ask Price, despite his frequent trips to the canvas). The bout won’t make the kinds of cash Eddie Hearn is looking for – his reputed £100,000,000 contract extension with Joshua needs to bring in the bucks – but it will potentially add another credible scalp to the list for the champ. Povetkin will duck in, unload, and get into AJ like Whyte did. He’ll even soak up a punch. This fight will be worth watching purely on that basis alone. But the bravery will come to an end and I expect the reality of being punched in the face by AJ when you’re almost forty will take a toll on Povetkin by the middle rounds. Joshua has bigger fish to fry – Deontay shaped ones. Povetkin is just the lonely appetiser.